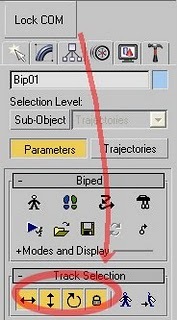 This script is actived to the 'lock COM keying' toggle, including Horizontal, Vertical and Rotation tracks at once in the selection track of the Biped root objects. Copies horizontal position of the biped onto the root object and links the biped to the root. Use it to create a root for your biped (using the Static Root option) - so you can place your biped with animation anywhere in the scene without adding extra keyframes. Simply move the root instead of the biped itself. Some game engines require a moving root to calculate biped's position in the game environment space. With a moving root the biped itself actually stays in place and only the root moves. AND MOTION_TRAKIN FOR THE FACE ANIMATION.. IF YOU ARE INTERESTED CONTACT ME BY E-MAIL "[email protected]"
OR SMS AT "+39 3478985253". THE PRICE IS 33€ OR LESS ....CONTACT ME. Using a selected biped body part this script will select the rest of the biped. If any of the parts are hidden or frozen they will be unfrozen or unhidden. This script will either (based on the object selected and its' subobject mode) paste a biped posture opposite or paste a skin envelope or mirror paste a skin envelope. to use motionmixed 'gameanimations' and let them follow a path. A tool for visualising the projected lower and upper masses (pelvis and base of the neck respectively) in relation to the feet of a standard Biped or CAT rig. Markers between the feet show where the masses intersect, which may help with determining where the static weight is distributed when posing. It does not take into account motion dynamics and so is intended for use when standing still. Additionally, when a foot is raised above the ground the foot line markers turn blue. Likewise if lowered below the ground they turn red.